Hemorrhagic viral illnesses, mainly seen in areas of Africa, are nearly always fatal and include Lassa, Marburg and Ebola viruses. 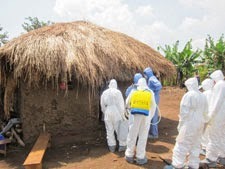 There are presently reports of a severe outbreak of Ebola in West Africa and it appears to be one of the most difficult outbreaks to control, according to the World Health Organization (WHO) after holding a press conference in Geneva. Since February, there have been approximately 150 cases reported, with approximately 90% resulting in death of the patients in Guinea. Other areas have been affected with a high mortality rate as well. Primary symptoms include fever, myalgias, headaches, vomiting, diarrhea, pharyngitis, diffuse rash and kidney/liver failure. Healthcare workers, family members and those having direct contact with patients are at increased risk for transmission of the virus. Very strict isolation precautions, including contact with secretions, are imperative and highly effective at preventing transmission. There are no preventative medications or vaccines, nor are there any drugs to treat these viruses, hence the need for strict precautions as these viruses can be prevented from spreading.